For rare-book collectors, an original copy of the Gutenberg Bible--of which there are fewer than 50 in existence--represents the ultimate prize. Here, Margaret Leslie Davis recounts five centuries in the life of one copy, from its creation by Johannes Gutenberg, through the hands of monks, an earl, the Worcestershire sauce king, and a nuclear physicist to its ultimate resting place, in a steel vault in Tokyo. Estelle Doheny, the first woman collector to add the book to her library and its last private owner, tipped the Bible onto a trajectory that forever changed our understanding of the first mechanically printed book. 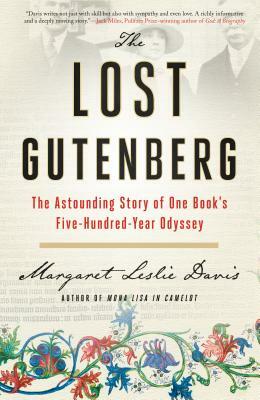 The Lost Gutenberg draws readers into this incredible saga, immersing them in the lust for beauty, prestige, and knowledge that this rarest of books sparked in its owners. Exploring books as objects of obsession across centuries, this is a must-read for history buffs, book collectors, seekers of hidden treasures, and anyone who has ever craved a remarkable book--and its untold stories. Margaret Leslie Davis is a graduate of Georgetown University and earned her master's in professional writing at the University of Southern California. Her award-winning books have been featured on Good Morning America, and in the London Sunday Times and Vanity Fair. She has appeared on C-SPAN Book TV and the History Channel's Modern Marvels as well as on the Discovery Channel and A&E's Biography. An experienced and sought-after public speaker, she has delivered addresses at many prestigious forums, including the New York Public Library, the White House Historical Association, and the National Gallery of Art.